I am gobsmacked by this book. I don't know where I picked up the notion that Carr wrote noir, but I cracked this book open expecting dames and hardboiled, hard drinking private dicks and speakeasies. It's hard to imagine how I could've been less accurate. 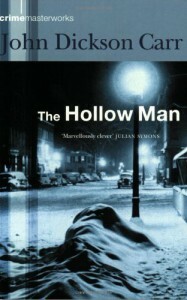 The Hollow Man had gothic overtones, oblique references to vampires and supernatural happenings, direct references to the ghost story writer M.R. James, and an extremely snowy, almost Victorian, London atmosphere. In other words, the background stuff was right up my alley. Attach this to not one, but two, miraculous mysteries, and a main character who reminded me strongly of Nero Wolfe, although I can't precisely put my finger on why, and a chapter that waxes eloquent on the locked room mystery and my, oh my, did I enjoy this book. The solution was very well done and - thankfully - did not involve an icicle in any capacity whatsoever. Unfortunately, this book is not available on kindle and appears to be out of print. I picked up my copy on amazon for under ten bucks, but it looks like the edition that I read isn't available for anything less than $90.00 at this time. I would definitely recommend checking it out, if you can find it. "But, if you're going to analyze impossible situations," interrupted Pettis, "why discuss detective fiction?" "Because," said the doctor, frankly, "we're in a detective story, and we don't fool the reader by pretending we're not. Let's not invent elaborate excuses to drag in a discussion of detective stories. Let's candidly glory in the noblest pursuits possible to characters in a book."